worldfootynews.com is pleased to announce the winner of our IC14 tipping competition: Seth McElvaney (USAFL Umpire's Director, Founder of the North Carolina Tigers). Remarkably Seth was runner-up in 2011, proving his good form was no fluke. In 2011 we asked tipsters to predict the result of each round, whereas this time we were pushed for time and launched our competition very late and simply asked for final ladders for the men's and women's competition. Final ladders were compared with the true finishing positions and points calculated for each position away the tipster was. All these "errors" were then summed and divided by the number of teams to give an average miss error. E.g. if there had been 4 teams only: PNG (1), Ireland (2), NZ (3), SA (4) and they finished in that order, but a tipster had placed them as Ireland (1), NZ (2), PNG (3), SA (4) then they would have had an error in each position of 1, 1, 2, 0 respectively, for a total of 4 and average of 1.0. The lower the error the better. Our winner Seth had an average error across the 18 men's and 7 women's teams of just 1.44. That was better even than the primary author of our world rankings, Cam Homes (ineligible) on 1.60. The worst entry (we won't name and shame) was 2.56. Seth even listed the top 3 in both the men's and women's exactly right. Congratulations to Seth, we'll be contacting you shortly to arrange a football related prize up to the value of $100. In this final instalment of the International Cup vignette series – one player interviewed per team of the 25 teams at the event – we chat with Hao Zhang, legendary player and team manager of the China Dragons. 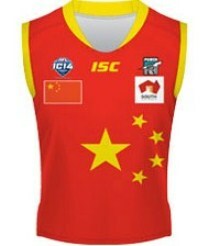 We look at his Australian Rules football journey and his take on the scene in China. On purely a win/loss ratio, the Sweden team at this year’s IC14 came out in front with three wins from five starts. On that basis, the Swedes can be justifiably proud of their standing – going down heavily in two games off set by wins against Finland, Indonesia and China. The performance also highlighted some of the new breed of Swedish players, including Timothy Lindgren. Timothy is a newcomer to the international Australian Rules scene. A product of the Port Malmö Maulers, the 17 year old represents an investment in the footy future in Sweden. Having said that, Timothy has been playing the game for 6 years, so international selection is reward for that commitment. Timothy discovered the game at such an early age due to his teacher also being the national Australian Rules coach, opening up that pathway early in his school years. The Fiji Vonu players at this year’s IC14 can all be proud of their place in history as representatives of the first Fijian women’s national team at an International Cup. But if at all possible, Siteri Tadrau might be even more proud, being the first woman to captain that national team. Siteri shares some of her experiences with us in this interview. With the International Cup for 2014 complete and most teams back home recovering and getting back to normal lives, players can reflect on their journey. The Tonga Thunder finished 6th overall after a narrow finals loss to Canada, and can hold their heads high after an event which saw three wins from five games. One of those players is Kisione Taulani, a young 17 year old midfielder in his first International Cup event. As well as playing for the Tongan national team, based in Nukalofa, Kisione is also a member of the Lauderdale Bombers Football Club in Tasmania, where he hopes to continue to develop his skills in Australian Rules football, and no doubt look to be a long term part of the Tongan national team at the next International Cup and beyond. SPECIAL LONDON Screening - ONE NIGHT ONLY Thursday 18th September 7.00PM DOWN UNDER CENTRE 48 Haven Green Ealing Broadway (near station). SPECIAL ZAGREB Screening - ONE NIGHT ONLY - Come see the movie starring Zagreb Hawks! Saturday 13th September, 1700 Old Pharmacy Pub at Hebrangova 11a, Zagreb. Plus don’t miss discussion with director Michael McIntyre. The Japanese national team ventured to Melbourne hoping for success, and to leave with three wins from five starts would have bought heart to the players who made the journey. One of these players is Yuki Akita and he took some time to share his Australian Rules football journey with us. Here we've put together some statistics on the 2014 International Cup as well as past tournaments. Some are important numbers, some are useless trivia. Feel free to suggest some other numbers. Rises/falls have been calculated compared with our last complete release, for 26th April 2014 after Denmark defeated Sweden (there were no more matches that qualified by our criteria prior to IC14). Canada and Japan are the big risers. Canada has climbed 6 places, winning four of their five IC14 matches, where fortunately for them the rating gap of each opponent was less than +/- 2.95 and as in three of these matches Canada achieved +40 point wins the rate exchange was the maximum of + 3.00 in each case. Their only loss was to their perennial nemesis USA where they lost only 1.04 rating points. The Northwind gained a total 10.91 rating points over the course of the tournament. No doubt the Revolution will be keen for another 49th Parallel Cup battle to climb back above their Northern foe. Japan won three from five, two of these winning matches reaped maximum +/-3.00 rate exchanges whilst they dropped only 0.46 rating points in the loss to Tonga seeing the Samurai climb from 19th to 16th place. Japan added a total of 6.78 rating points during the Cup. Japan had previously played a lot of teams well up the ladder and their rating points had suffered as a result, so their rise can be seen as something of a correction. A collection of our photos from the final round of IC14 matches (excluding the Men's Top 4 and Women's Grand Finals - see earlier stories).